Leaving for college is full of goodbyes from friends and family and getting countless words of advice from everyone as you give them one last hug, and I found it all too strange that one of my most common pieces of advice, besides the “study hard and have fun, but not too much fun” line, was “avoid the freshman fifteen”! This seemed absurd to me. Was people’s biggest concern really that I would leave looking one way and return for Thanksgiving break fifteen pounds heavier? Because I can assure you that this was definitely not up on the top of my list of freshman worries that could possibly lead to my downfall. Of course, I have heard of the infamous freshman fifteen before, but I never really gave it a second thought, always assuming that it could not be real. If anything, at a school as big as Penn State, I thought I might lose a few pounds between averaging 15,000 steps a day and skipping a meal here and there to study, so I decided to do a little bit of research myself to see if my hypothesis of the freshman fifteen being nothing but a myth is correct. The Freshman Fifteen is REAL! According to Jennifer Warner, the freshman fifteen should be one of every freshman’s biggest fears. In this study, researchers found that freshman do in fact gain weight during their first year at college, but of those students that do gain weight, it is not a huge amount. In just the first semester, these freshman gain about an extra 5% of their original body weight, but usually it adds up to around ten pounds. However, in my opinion, the 25% of freshman that the statistic pertains to may have other reasons for weight gain than just being a freshman in college. Yes, that is a lot of people, but there are also a lot of other factors that could play into this freshman fifteen. For one, if you are a freshman who is choosing to go to parties and drink every night, expect to be plagued by the freshman fifteen because not only are you drinking a major amount of extra calories, but you are most likely eating more too. This drastic weight gain could also be coming from your frequency at the ‘all-you-can-eat’ buffets or your lack of physical activity along with the many changes in your environment and behavior as you enter college. On the other hand, the next research study I looked at is telling me that there is no need to fear because the freshman fifteen is irrelevant to the majority of college freshman. According to this post, most college students did not gain any weight in their freshman year, and even the students who did gain weight usually gained no more than five pounds. Five pounds is a lot more manageable than fifteen, but still does show a slight correlation between starting college and gaining weight. However, according to this study done at Ohio State University, most freshman only gained about three pounds, and in this same study researchers found that very few freshmen actually gained fifteen pounds during their first year, with less than one tenth of students reporting this significant weight gain. Reading that only this small fraction of students actually gain fifteen pounds surprised me considering how much the freshman fifteen is played up in the media, but what surprised me even more was that one in four freshmen lost weight!! Everyone always says that college is a new beginning, a fresh start, and I guess those freshman used this new beginning to change their diet and get in shape! All in all, for most of you, the freshman fifteen will be nothing but a myth, conditionally proving my hypothesis to be correct, but the freshman four might be more realistic. That being said, as long as you continue with a healthy diet and exercise regularly (including the hike to class from one end of campus to the other), you really should not be worried about anything! Don’t let your guard down too fast!! According to this study, the majority of college students will gain weight while in college, just not all during freshman year like the freshman fifteen theory. So in my words of advice, don’t believe that you have beat the freshman fifteen until AFTER you graduate, or you may be looking at the senior sixteen, and NO ONE wants that!! This entry was posted in Uncategorized on September 5, 2016 by Jessica Heckler. I like your topic and I really enjoy your writing style! As a freshman, I definitely am worried about the infamous “freshman fifteen”, but your blog post helps me relax a little. I definitely do what you do, skip meals to study (or nap), and within the first week I had lost weight! Of course I think I’m stabilizing now that I’m adjusted to a new schedule, eating lots of snacks an only one big meal a day. The only thing I’m still concerned about is the Creamery ice cream- now that is going to kill me! Here is an article from WebMD that talks about the benefits of eating throughout the day versus 3 large meals. I’m not going to lie, I was (am?) so afraid of getting the freshman 15. This is the first time in my life I’ve actually been on my own, leaving me with a ton of new choices. My parents aren’t here to cook me homemade, healthy meals and advise how much I snack on during the day. It also doesn’t help that the dining halls serve what seems like the same food EVERY DAY. That makes me want to go downtown and get fast-food just for the purpose of changing things up. However, I’m more than confident I will go home Thanksgiving break the same weight (hopefully less) than what I came. Participating in club sports, along with going on runs and joining the gym, has already definitely helped me already shape the lifestyle I want. Staying busy and just trying to make the healthier choice in meal is a lot easier than expected. And just like everyone else here said, there is no need to worry with how big/hilly our campus is! As a senior in high school everyone always warned me about the dreaded 15. As someone who is very health conscious and likes to stick to a regular routine workout plan, this “myth” scared the heck out of me. For my first few days of being here at school I was able to walk about 8 miles a day and exercise on top of that. As soon as the first week of classes started my work load got a lot bigger and my time allotted to workout disappeared. However, I find myself averaging about 8 miles a day of walking and on weekends I walk even more than that. For me the freshman 15 seems as if it is something I can beat. I had a very similar response to the freshmen 15 as you. I told myself that as long as I continued to eat healthy and hit the gym a few times a week I would be totally fine. As far as I can tell, I was successful my freshman year. I am however concerned for others who do not like the taste of healthy foods. I think the dining hall instigates the weight gain because of all the unhealthy choices they serve. Now, I hate to be that person because there are many healthy options but should they really be serving pizza, burgers and french fries every single day? I know that ever since I moved into my apartment and started making my own meals, I have been eating a lot healthier. I blend a fruit smoothie for breakfast, a salad for lunch and various healthy easy recipes for dinner. But, I have the luxury that some other students don’t: time to make these items. I think it really just depends on who you are, what you eat, the time you have, and how important health is to you. Check out this article on the challenge of eating healthy on campus! I found it very interesting. As a sophomore looking back, the freshman fifteen was definitely a concern that loomed over my head in the beginning of fall semester. 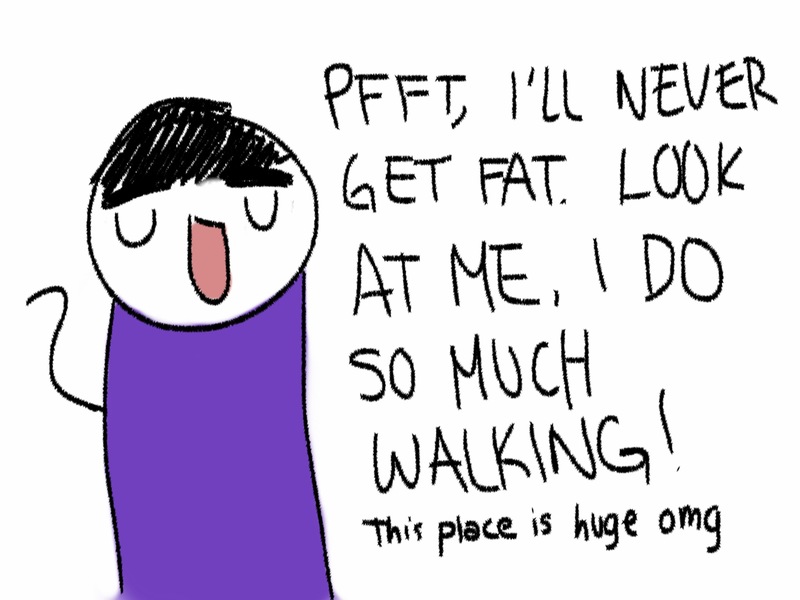 It’s easy to overeat especially when you think you’re exercising and burning a lot of calories walking around campus. Home cooked meals are far and few between (if you’re living on campus), so processed and ‘quick’ snacks seem to be the only options to choose from. Factor in partying and it’s hard to keep track of just how much you consume during an average week. Warding off the freshman fifteen definitely takes discipline, but it is possible. Sometimes what we think is hunger is actually boredom or stress. Drinking water can help suppress these types of hunger that usually cause you to crave something that’s heavily sweat or salty. When it is time for a meal, make sure to eat vegetables and fruits. It takes your body longer to digest vegetables, so you’ll be satisfied for a longer period of time. The sugar found in fruits provides your body with energy without the crashing effect that candy or energy drinks can cause. Last year when I’d go food shopping, I only bought snacks like nuts, fruit, and yogurt to keep in my refrigerator/room. I found that if I didn’t keep snacks like potato chips or ice cream in my room, I didn’t crave them because they weren’t an option. Eating healthily all of the time is an attainable lifestyle, but everything (in moderation) isn’t detrimental either. Treating yourself to Creamery ice cream or Wings Over every once in a while will not make you gain weight immediately. Just remember to be mindful of what you’re eating because those choices will reflect your mood and energy levels throughout the day. Here’s a link to an article that gives you recipes you can create using dining hall food (or even in your dorm)! The freshman 15 is one of the most notorious subjects talked about relating to college. Many people think they are automatically going to gain the weight, while others do not believe in it at all. I personally do not believe in freshman 15. For most students, college is their first experience living alone. No one tells them what to eat. People have to be in charge of their own diets. My mom is a fitness trainer and nutritionist and one of the things she preaches is portion control. Many of the food halls here are buffet which can be dangerous. Another thing that can jeopardize your weight is the amount of late night food people eat. When you eat very late the food tends to stay on you more than eating at normal times. If people in college paid more attention to these things, they could avoid gaining any significant amount of weight. According to a faculty colleague of mine, the Freshmen 15 was called the Freshman 10 at the turn of the century…. I found this blog post very interesting considering I was terrified of gaining the freshman fifteen when I first started college. It is very scary to think that your eating habits could change drastically over a short period of time just because you decide to go to college. I found a link here showing how college students can eat healthy even with all the junk food surrounding them. Enjoy! When I first heard of the term “freshman 15” I was truly scared due to the amount of food I consume in a day. When food is readily available for me I will eat every crumb thats left. I really tried when I first got here to make a valiant effort to only eat healthy and to avoid all the endless buffet food that Penn State offers. Now that I’ve been here for three weeks all of those mature ideas have been thrown out the window. Due to how big the campus is and how much walking I’ve been doing going from class to class and having at least a 15 minute walk to anything from east halls, I need to eat more than I ever have to stay content and not be hungry. FRESHMAN 15 IS NOT A THING AT PENN STATE. I need to eat more than ever just to stay the weight I was when I first arrived here! Nobody should worry about freshman 15 here because we’re losing all the calories we’re gaining from eating here, by walking!